On Nov. 3, the Federal Open Market Committee announced a $600 billion quantitative easing, which is now known as QE2. There was an unusual amount of dissent at the Federal Reserve about this, led by the president of the Federal Reserve Bank of Kansas City. Treasury Secretary Timothy Geithner said that the $600 billion program of buying longer-maturity Treasuries would have the same effect as a 0.5% point reduction in the federal funds rate. But reducing the fed funds rate by that much isn’t an option anymore because the Fed has already cut that to between a 0.25% and 0%. Therefore, the Fed goes into quantitative easing, which is one of the last bullets in the arsenal. The hope is to reduce long-term interest rates and reduce borrowing costs to help reflate the economy and stimulate economic output. Read Fed Chairman Ben Bernanke’s explanation for further quantitative easing. My sense is that the Fed voted to go ahead with QE2 because of the data in the third-quarter report on Gross Domestic Product. 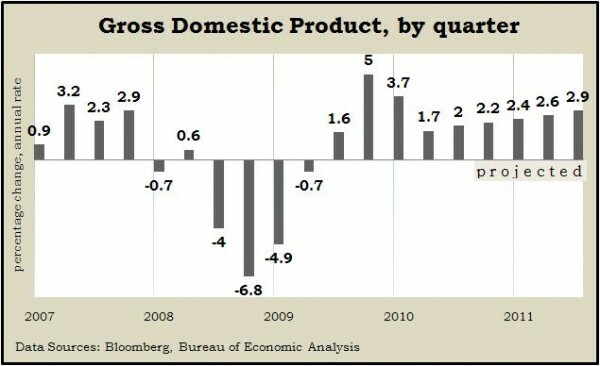 That suggested a whole lot of the 2% increase in the third quarter was inventory rebuilding that may not be sustainable. I think that QE2 will help, but it’s not going to be the panacea or cure-all for our economic problems. It’s very interesting that bond yields started going up right after the QE2 announcement, and bonds have sold off over 1% since then. And the Fed hasn’t even started deploying the money. The reactions are just in anticipation of the program. Some analysts say that once the Fed actually starts spending the money, the yields will come down after a couple of months. On balance, I think QE2 is a good thing. And to the criticism of it being inflationary, let’s just hope that the Fed is nimble enough to reduce stimulus before inflationary pressures build to the point where they’re uncontrollable.